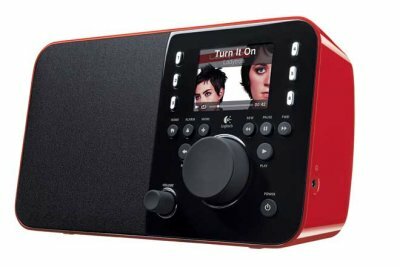 Logitech has announced the Squeezebox Radio, similar in concept to the Squeezebox Boom which I reviewed earlier this year, but smaller, cheaper, and with a colour screen. It’s set to go on sale soon at $199.00. Say you just discovered a new track listening to Pandora® on your Squeezebox Radio. Now you can tell your friends about it instantly. You can display your Facebook page right on the screen; and send music recommendations to your Facebook friends the moment you hear that amazing new track. There’s no remote included as standard, but a $50 accessory pack will provide both a remote and a rechargeable battery, for portable use (but don’t go too far, because it depends on a wi-fi connection). I am a big fan of the Squeezebox system, though it is not the easiest thing to explain in a few words. It’s interesting that Logitech is choosing to emphasise the internet radio aspect – handy for UK listeners threatened with the loss of FM – rather than the networked music player using a local server that is the original Squeezebox concept. I’ve used Squeezebox in conjunction with a Napster all-you-can-eat subscription, and the combination works very well indeed. Logitech needs to support Spotify, which has faster start-up and more mindshare than Napster. It’s a logical move for both companies. Facebook support on the other hand I can live without. The snag with selling this as a radio is that it looks very expensive for what it is. $199 for a radio with Facebook support? The high price together with the complexity of setting up SqueezeCenter (if you do) is what holds the system back.